Journalist Anne Batty in front of Monte Carlo Casino. At the end of a sharply curving roadway on the Basse Corniche (lower shelf) of a stony mountain overlooking the turquoise waters of the Mediterranean Sea, sits the enchanted kingdom of Monte Carlo, Monaco. Visiting there is like stepping into a dream from which one never wants to wake. Nestled between France and Italy, it is a fairy tale place inhabited by princes, princesses, distinguished counts and bejeweled countesses, tycoons, sports icons and celebrities of all kinds. A veritable playground and dwelling place for the international jet set, the very rich, famous and successful. 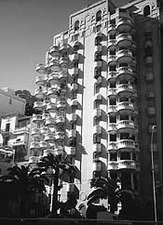 Accessible from Nice airport via pricey helicopter or taxi rides, the living is large in Monte Carlo, and the standards are high. It is a domain with no income taxes and low business taxes, one that thrives as a monetary haven for those who have established residences and set up businesses, offices and bank accounts there. The dwellings in this land are a blend of Old World and modern architecture, with ornate villas, apartments, palatial buildings and high rises snugly sharing limited space. 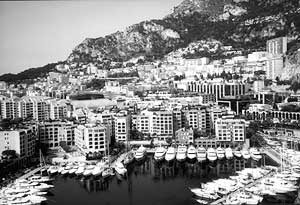 Hotels - luxurious to moderate - dot the landscape, and lavish yachts fill the harbor at Port de Monaco. Home to the Grand Prix, the narrow winding roadways in Monte Carlo echo with the sounds of racing motorcycles, accompanied by the constant hum of luxurious Ferrari, Lamborghini, Porsche, Mercedes and Rolls Royce. Equally sharing the serpentine speedways with the more moderate vehicles, mopeds, busses and an occasional limousine. Gleaming shop windows line the city streets, showcasing the latest designer fashions and dazzling jewels. The primary dress code is casual elegance. With gentlemen commonly clothed in suits and ties, dressy shirts, slacks, leather or sports coats, while ladies appear predominantly in black – walking shoes, mini-heels, boots, dresses, pant suits and leather jackets, complimented by colorful silk scarves and expensive jewelry. Obscure cobblestone side streets and alleyways conceal unusual boutiques, sweetshops, bakeries and sidewalk cafes, where dining al fresco and people watching are favorite pastimes. A friendly multi-cultural population gathers there, speaking French, Italian and a smattering of English. And their pace is somewhat slower, as they - along with many shopkeepers closed at noon - enjoy leisurely two-hour lunches accompanied by much wine and intimate conversation. Lovely gardens occupy space throughout the city. 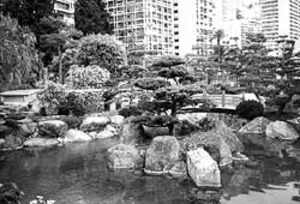 Resplendent parks and multi-colored gardens filled with the musical sounds of flowing water occupy space throughout this city, and the sun is said to shine there most of the time. Only three miles long, and a half-mile climb up the rocky slopes, this cameo kingdom is the ideal place for walking, and it is almost impossible to get lost if one simply remembers to keep traveling down. The well-guarded streets can be safely strolled at any hour, protected by police and cameras on every corner. And it is said someone could win a million dollars at the main casino and carry it through the streets without a worry. Evening dining in Monaco is a culinary delight, an expensive treasure house of gourmet feasting well worth the price. Italian is the predominant fare, along with Parisian, American and even Mexican. While the finest of wines, cheeses, fresh fruits, breads and desserts compliment most every menu. At the end of the day, this enchanted kingdom offers round-the-clock pleasures and exudes an undeniably unique, nighttime energy. Twinkling lights in every part of town illuminate the dark. Gambling is freely enjoyed in two casinos, one formal and one casual, and nightly discos entertain visitors into the wee hours of the morning.